London cyclists. Who clearly shouldn't apply for jobs at Carbon Trust. The Carbon Trust is a not-for-profit company with the mission to accelerate the move to a low carbon economy. We provide specialist support to help business and the public sector cut carbon emissions, save energy and commercialise low carbon technologies. By stimulating low carbon action we contribute to key UK goals of lower carbon emissions, the development of low carbon businesses, increased energy security and associated jobs. Sounds great. Innovative. Progressive. N'est pas? One senses that this is an organisation that would, whether directly or indirectly, support transportation like... oh I don't know... bicycles. An organisation that places weight on science and rationality and common sense. "For those of you who choose to cycle to work (or for work), you are reminded that you are responsible for ensuring your own safety. As a reminder, the use of appropriate cycling helmets, lights and hi-visibility equipment are considered essential, particularly with the nights drawing in. 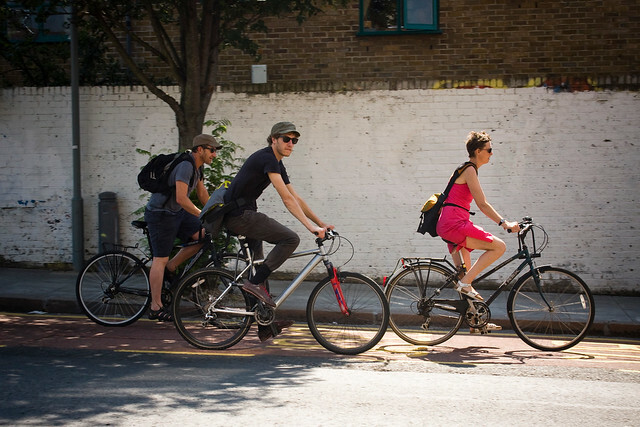 In addition, if you do not consider yourself a competent cyclist, who has taken appropriate provision for your own safety, we advise against you cycling to and from work and for work related meetings and events and from using the London cycle scheme. If you choose to cycle FOR work (e.g. attending an external meeting) again your safety is your responsibility. However, the Carbon Trust has a duty of care for all of us, and for this reason, the company does not advocate cycling to and from meetings on company business and an alternative method of travel should always be considered. Expense claims for hiring Boris bikes will not be reimbursed by the company. The reason for this is that the company cannot assess the quality or safety of any Boris bike and it is impractical for it to undertake risk assessments for each individual journey and to provide training and equipment." I was sitting here toying with ideas as to how to criticize or even ridicule Carbon Trust but I realised that just pasting their text into this blogpost and letting you read it was quite enough. I hope the CTC gives them a right good talking to.